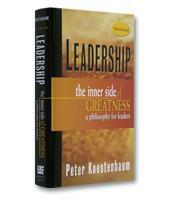 In Leadership: The Inner Side of Greatness, legendary business philosopher and thinker Peter Koestenbaum invites managers to break out of the ordinary managerial mindset. He reveals how striving for greatness enables managers to focus their efforts and grasp new ideas and insights by bringing intensity and meaning to their work — thereby improving their ability to achieve bottom-line results. He also demonstrates that when leaders live out their deepest and most personal commitment to excellence, they bring out what is great in others as well. How to develop long-term vision and marshal the courage to take risks and act with sustained initiative. How to live a courageous life and manage anxiety. How to reach greater heights of ethics and responsibility. What managers must be to become truly effective leaders.